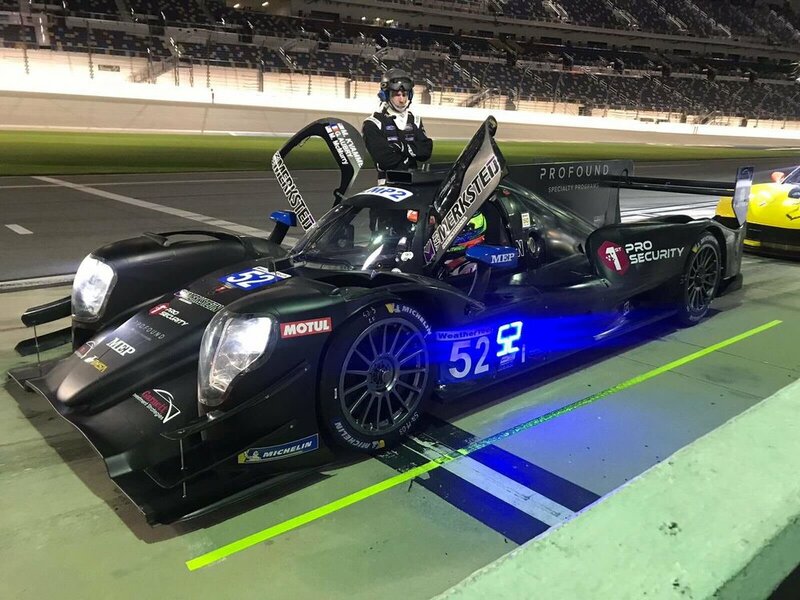 January 8, 2019 – Daytona, Florida – PR1/Mathiasen Motorsports had an impressive first outing in the 2019 IMSA WeatherTech SportsCar Championship posting the fastest lap time of the LMP2 class with a 1:35.930 (133.591 mph) in the #52 ORECA. PR1/Mathiasen Motorsports put together the LMP2 program just in time for the Roar Before the Rolex 24 and were more than ready to get on track after deciding to run the new ORECA 07 chassis at the end of the 2018 season. Matt McMurry and Gabriel Aubry came into the weekend prepared to take on the high banks of Daytona International Speedway and were joined by their third teammate, Mark Kvamme, who got to take his first laps with PR1/Mathiasen Motorsports. The Roar Before the Rolex 24 provided a crucial opportunity for teams and drivers to get acclimated with their machines and the 3.56-mile circuit. A specific “qualifying session” also runs to determine where the teams will be placed in the paddock and their garage positions. Despite driving the historic track for the first time, it was Aubry who posted the fastest lap time in the LMP2 category. Running the fastest lap time will put the team in the best paddock and garage position behind the DPi class for the Rolex 24 at Daytona. Now, PR1/Mathiasen Motorsports’ primary focus is to keep fine-tuning their race strategy and setup of the #52 ORECA. An announcement of the final driver to add to the lineup will be announced shortly. Activities for the Rolex 24 at Daytona begin on Thursday, January 24 with the green flag set to wave at 12:35 p.m. EST on January 26.